DA BLOOZE BROTHERS is an explosive, funny and entertaining tribute to The Blues Brothers with music, action & comedy. 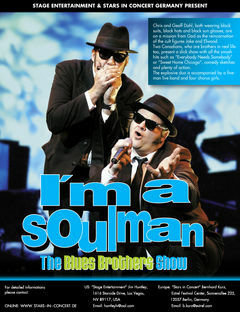 This amazing act covers Jake & Elwood’s classic blues songs and more while appearing to be the original brothers live on stage! Chris and Geoff Dahl, both wearing black suits, black hats and black sunglasses are on a mission from God as the reincarnation of cult figures Jake and Elwood. Two Canadians, and brothers in real life too, present a slick show with all the smash hits such as “Everybody Nees Somebody” or “Sweet Home Chicago”, comedy sketches and plenty of action!